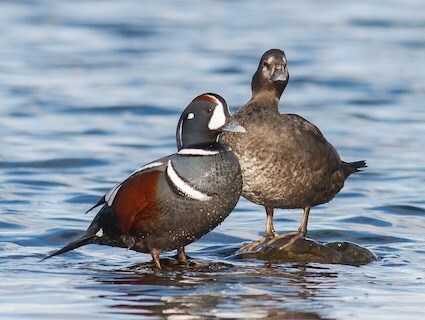 Left: male harlequin duck, photo by Mike Yip. Right: male and female, photo by Julian Heavyside. 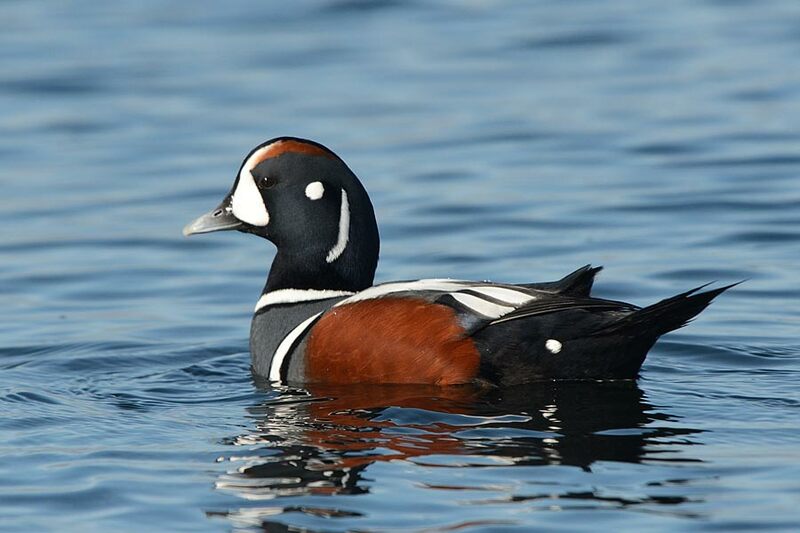 The male harlequin duck has striking plumage, with its dark body contrasting sharply with white stripes at the tops of its wings, around its collar, and down the side of its face. Orangey-red patches mark its sides, and a stripe of the same colour runs over each eye. Its wings are striped with white and dark. The female is all brown with a whitish belly Both male and female have a white patch behind each eyes and at the base of their bill. Both also have grey-black beaks and feet. Juvenile plumage is similar to the female but with a darker belly. 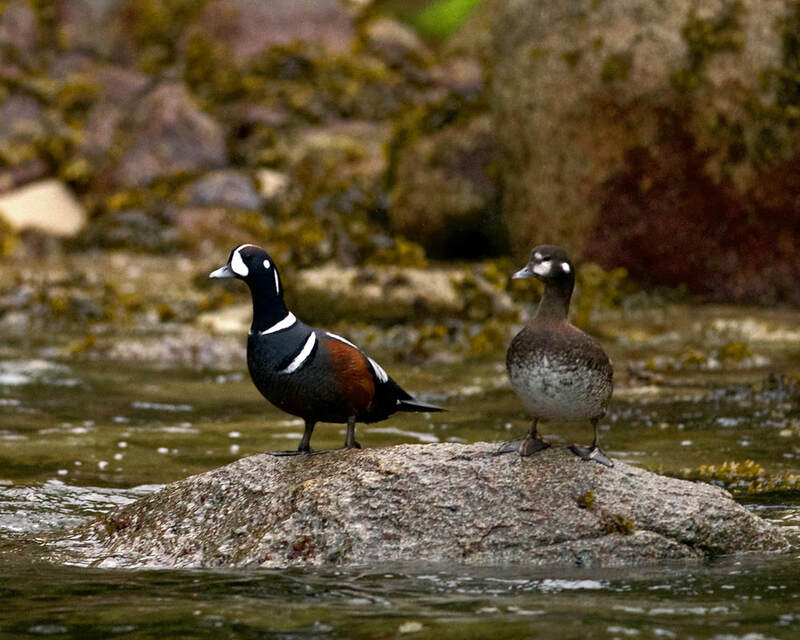 The harlequin duck inhabits rocky coasts during winter and in fast-running steams and rivers while breeding and nesting. It is found on the west and east coasts of North America during the winter. In summer it breeds inland, mostly in BC, Yukon Territory, Alaska and some areas of the east coast. The female bufflehead may appear similar to the female harlequin duck from afar, but the former has a much larger head and is more grey than brown. Various scoters may also have similar colouring, but they have much larger bills and more sloped foreheads. The harlequin duck is hunted for sport, and is considered a trophy species likely because of its distinct plumage. Harlequin ducks are sometimes called sea mice because of the squeaking calls they make. Click here to listen to these sounds. Dunn, J. L. and Alderfer, J. (Eds.). (2006). National Geographic Field Guide to the Birds of North America. (5th Ed.). Washington, D.C.: National Geographic Society. Pp. 44-45. Harlequin duck (Histrionicus histrionicus). The Birds of North America Online (A. Poole, Ed.). Ithaca: Cornell Lab of Ornithology; Retrieved from the Birds of North America Online. Accessed 18/02/2013.